With Jean Veloz Live, In-Person! Who needs a city proclomation? 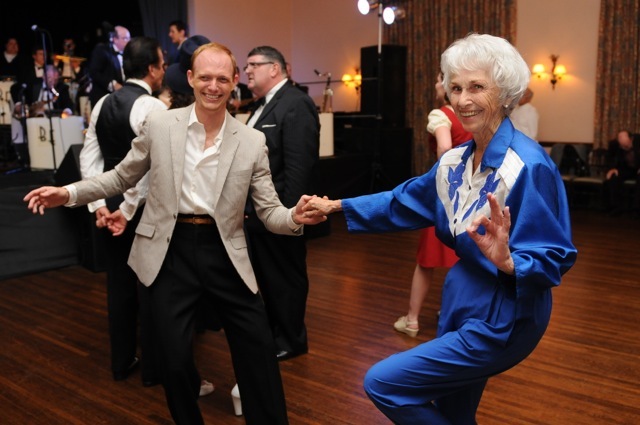 Jean Veloz is our very own Swing Dance treasure, and we should celebrate her as much as possible. So, I, Rusty Frank, proclaim it to be so! Why not? I have been working behind the scenes for some years to get some certain celebrations ... and, lo and behold, they both have been scheduled for the same day! Join us at the Egyptian Theatre at 11:30am for an actual FILM showing of "Groovie Movie". This is the first time, since the short film came out in the 1940s that it has been shown in a theater on film (not DVD, not VHS). And imagine... the gorgeous big screen of the Egyptian on Hollywood Boulevard! The showing is part of the annual Cinecon Film Festival. This festival focuses on films that are extremely hard to see, not available on DVD, etc. I'll be introducing Jean before the film and then doing a short interview with her after the movie. 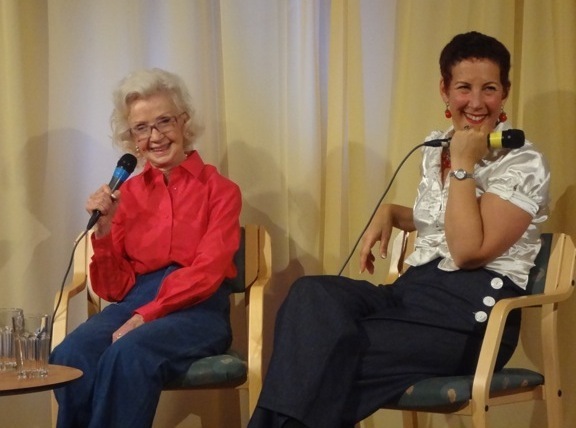 I've been attending Cinecon since 1992, and have been instrumental in getting some guests to the event, including Ann Miller, Francis Lederer, and Bob Scheerer. For the past four years, I have been urging the board to get "Groovie Movie," as Jean, who stars in the movie, lives right in our own backyard. The board was able to get a film print from the studio! You'll need to get a day pass for the event, which is $30. You can stay all day and night and watch movies for that. They show movies from about 9:00am-midnight! 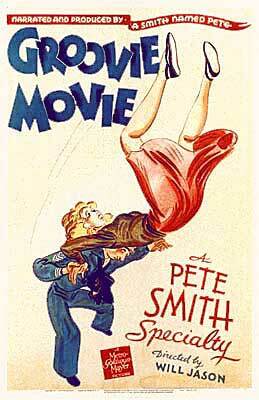 Remember, this is the FIRST showing of "Groovie Movie" on FILM since the 1940s. And, it's at the Egyptian!!!! Visit the CINECON website for all the details on the festival. IN THE "JOHNNY HOLIDAY PROGRAM"
That's right! Jean Veloz will be performing a swing dance with Los Angeles favorite Chris Grover as part of the Johnny Holiday Program. This is such a rare opportunity to see Jean highlighted on the dance floor (Giovanni had to bow out because of a special job assignment) . You simply MUST come! You can have dinner or just come for the show and dancing. Of course, we'll be having dinner! Dean Mora will be leading the big band, so you'll have plenty of great music for dancing the night away, PLUS loads of fabulous entertainment. 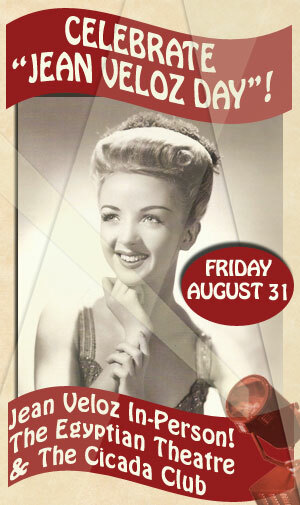 Here's the scoop: FRIDAY, AUGUST 31 - THE JOHNNY HOLIDAY PROGRAM. You are invited to a night of great music and dancing featuring a special performance by swing dance legend Jean Veloz! Dine and dance to Dean Mora and the Melody Boys 10-piece band plus the Satin Dollz dancers. Enjoy a fabulous show in the style of Johnny Holiday's uncle Bing Crosby's classic radio program. Save $5 off each pre-sale ticket you buy. Use promo code JOHNNY5OFF at checkout. Hurry! Offer ends soon. SEE JEAN VELOZ DANCE NOW! 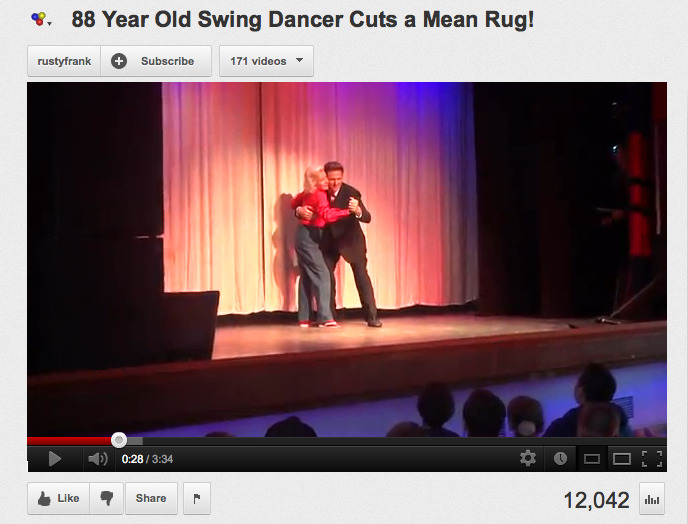 If you missed the clip I posted of Jean Veloz dancing in Herrang, Sweden last month, take a look HERE.